The industry standard for over a quarter century. The DW 5002AD3 Accelerator Chain-Drive Double Pedal features a host of refinements and upgrades to its original, performance-proven design. 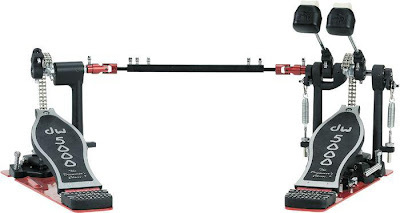 The legendary DW 5000 Series bass drum pedals have remained "The Drummer's Choice" and the standard of the industry for over a quarter century. The workhorse 5002AD3 features a strap drive with accelerator (offset cam). Other features include aluminum hex shafts, pedal plates, and linkages; dual/side-adjusting hoop clamps; 101 2-way beaters; and built-in spurs plus all the versatility, adjustability, and reliability that allows players to customize the feel and performance to fit the way they play. Its patented Single Post Casting design provides ease of movement between the pedal and hi-hat, also allowing the pedals to be played independently or simultaneously.